For years, online retailers have been exempt from collecting sales tax in states where they didn’t have a significant physical presence (also known as nexus). However, as state budget deficits grow the definition of nexus is expanding in many states to increase business’ sales tax obligations. Additionally, legislation across the country is making it more difficult for businesses to avoid sales tax collection. The Marketplace Fairness Act of 2013 (MFA) is gaining momentum in Congress and if it passes, internet and remote sales tax will be the new reality for many businesses. Many believe the bill will help level the state tax landscape for remote online retailers and “brick-and-mortar” retailers. That is because the bill would allow states to require out-of-state businesses to collect sales tax, even when they don’t have a physical presence in-state. If this bill becomes law, states would gain authority to make remote businesses collect sales tax, some as early as 180 days after the bill’s passage. On May 6, 2013 the Senate passed the Marketplace Fairness Act of 2013 by a vote of 69 to 27…The bill now moves to the House. 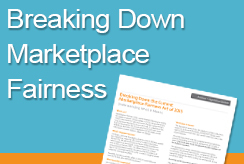 If passed, Marketplace Fairness would add complexity to an already burdensome business process. Additionally, remote sellers will have the added burden of meeting sales tax collection and remittance requirements in each state into which they sell, and in which they do not currently have nexus. You can no longer assume that just because you do not have a physical presence (nexus) in a state, you are immune from sales tax obligations. So the time is now to automate your sales tax processes directly within your Sage ERP. Contact DSD Business Systems today at CareTeam1@DSDinc.com to learn more.